It was finally a clear day so I went for a walk through the hills. Next to the guest house where we are staying on campus, there is the Miramare train station and a path leading further up the hill. There is a park of sorts in this steep area on the hillside. The first half is through trees, a few in the middle of the stairway. 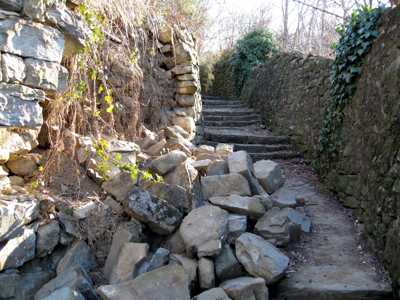 The stairs are old, but not that old, as there is a utility cable buried along the path. You can see it in spots where the stone wall has collapsed. But in some places there are older stone steps surrounded by newer construction, so clearly they have been there a while. The finish and color of the old stone match those around Miramare so perhaps they are from the same period. There are about a million stairs up the hill, but the view is spectacular. There is a clear spot where you can see for kilometers around the Gulf of Trieste. If I can stitch together the panorama I’ll post it. Further along there were a few small farms, an old stone well and then you come out on the outskirts of Prosecco where there is a community playground by a pond. I followed the road into the village to have a look around. I was stopped on the street by an African guy carrying a big gym bag, who seemed to only want to wish me a good day. In English, in the middle of an Italian farm village. My brand new white sneakers and fleece jacket must have given me away. As soon as he said he was from Nigeria I knew I was in for a story. He said he lived in Monfalcone, a town some kilometers away, and it’s very difficult you know to make a living when one does not have a work permit. So he and his friends bring some small items in from Rome to sell to make a few euro. At 7 euro for a package of socks I was not going along with it. Living in San Francisco pretty much cures you of giving in to sad stories and goods for sale of dubious origin. So I wished him good day and went off in a totally different direction. As quickly as possible. Prosecco had more signs in Slovenian than down the hill and it is closer to the border. My Trieste bus map isn’t so good out there so I’m not really sure how far or in which direction. 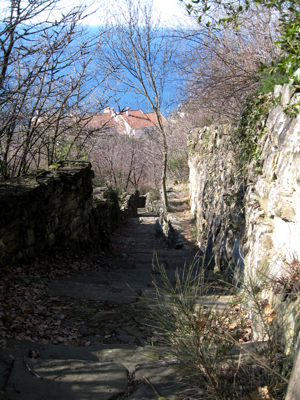 I had intended to walk to to Villa Opicina but I didn’t see a path except by the narrow highway. High speed road, stone walls on either side, no clear pedestrian path. I’ll explore that another time on the bus. I took a tiny unmarked road down the hill, crossed another highway (Strada del Friuli) and continued down what looked like an oversized goat path which around here often passes for a public street. I was in Contovella. The road was paved, which gave hope for it going through somewhere. The other option was highway, so I figured why not. I somewhat questioned that decision at various points, particularly when the road was closed for construction. Along the way there were several narrow staircases down the hill, some more scary than others but none had railings and the steps were not exactly in good repair. One was a private path, another was clearly well used by the trash left behind. All through here the road was a cliff on one side and the hill (or stone retaining wall) on the other. 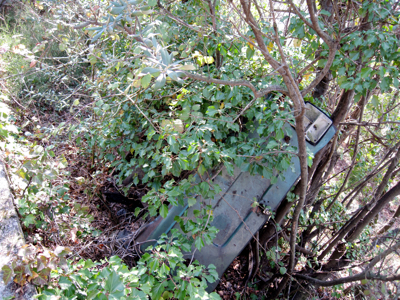 There was a vehicle that went off the road decades ago, now rotting in a tree. Down the road I continued, squeezing past the barriers around the idle construction zone, where a new section of retaining wall was being built near some expensive looking houses. The road widened into a proper street here (although still narrow) with houses and small apartment buildings. Eventually it went back under the train tracks and let out in the center of Barcola. I got a bottle of water from the same shop I went to yesterday, hung around in the park for a while (remembering to bring extra tissues for the public toilet!) and headed back out to Grignano. This entry was posted on 25 February 2009 at 7:33 am	and is filed under life. You can follow any responses to this entry through the RSS 2.0 feed. You can leave a response, or trackback from your own site.